Biological rhythms that repeat approximately every 24 hours are called circadian rhythms. Light is the main stimulus that helps the circadian clock, and thus circadian rhythms, keep a synchronized rhythm with the 24-hour day. If lack of synchrony or circadian disruption occurs, we may experience decrements in physiological functions, neurobehavioral performance, and sleep. Lighting characteristics that are effective to the circadian system are different than those effective to the visual system. 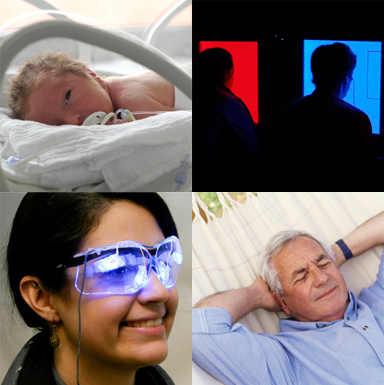 In order to apply light to mitigate symptoms of Alzheimer's disease, depression, jet lag, or sleep deprivation, we need a better understanding of the quantity, spectrum, timing, duration, and distribution of light that is effective for the circadian system. 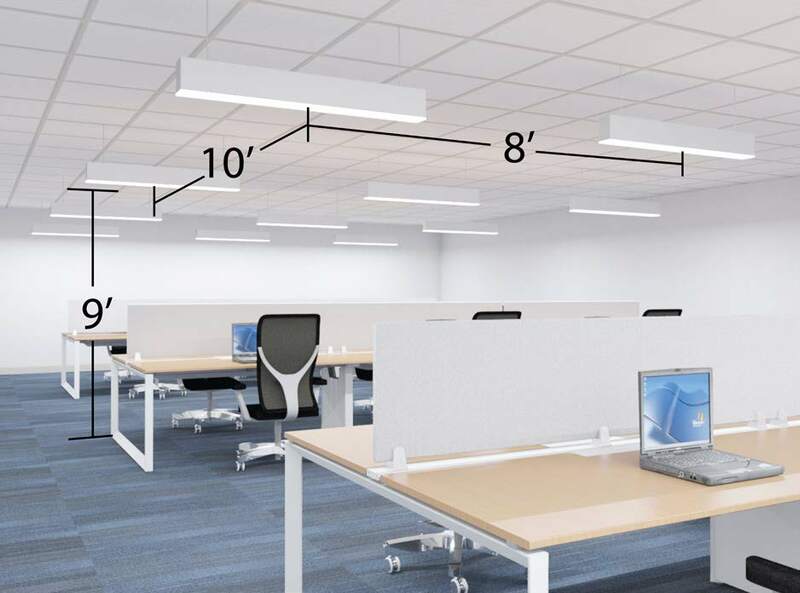 These look-up charts provide a quick and easy way to estimate the potential average CS value in a space using conventional lighting metrics. The website, Lighting Patterns for Healthy Buildings, assists lighting designers and specifiers in selecting quality lighting that supports healthy living. Designed in the spirit of traditional architectural pattern books, it presents model designs for typical rooms that can be adapted to specific buildings and styles. The patterns are based upon the 24-hour lighting scheme for older adults proposed by Mariana Figueiro in 2008, which recommends cycled electric lighting with cool, high light levels for high circadian stimulation during the daytime, and warm, low light levels for reduced circadian stimulation in the evening, along with good lighting for visibility, and nightlights to provide horizontal/vertical cues to improve postural control and stability. 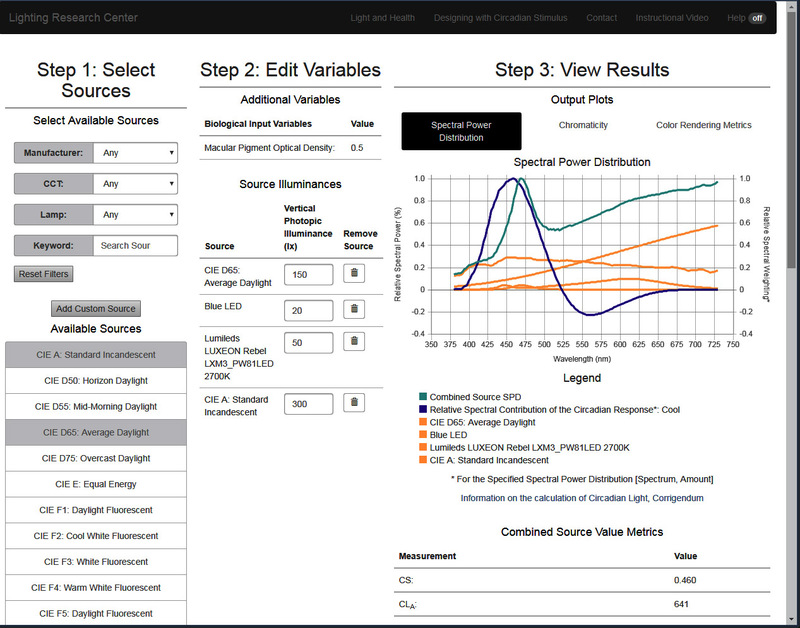 This website allows users to view lighting patterns showing base case and new lighting design analyzed for circadian stimulus (CS). Each pattern presents lighting plans, renderings, and generic luminaire information useful for providing healthy lighting throughout the day. LD+A Article "Designing with Circadian Stimulus"
This article provides a basic introduction to designing with the CS metric. 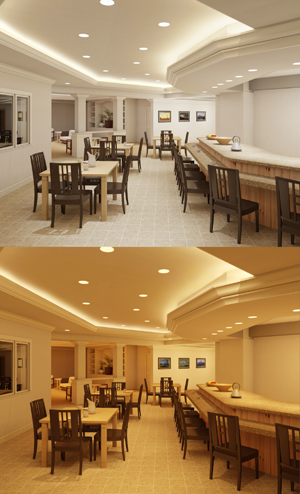 In the article, LRC researchers explain the metric and present useful tips to help designers create lighting plans that deliver prescribed amounts of CS. The article is available here.